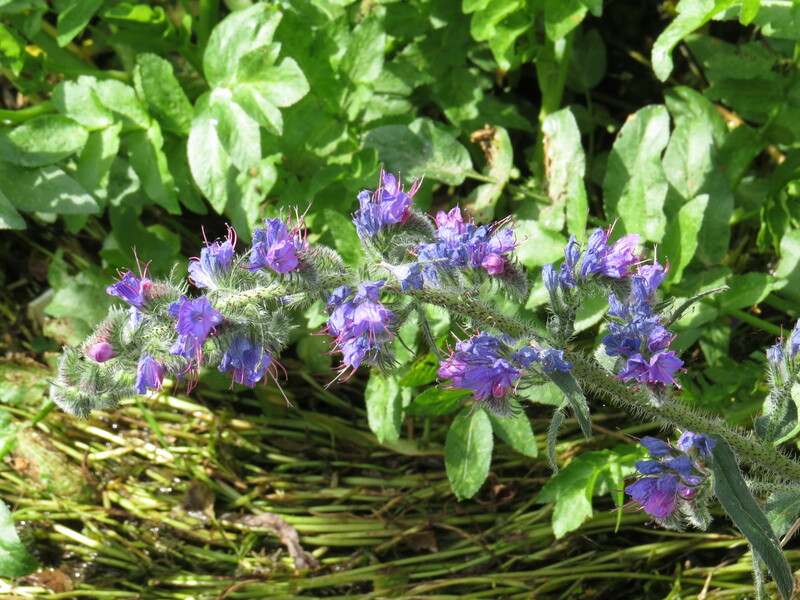 Dear Readers, nothing delights me more than finding a plant that my guide describes as ‘common’ but which I have never seen before, and so it is with Viper’s Bugloss. What a fantastic plant it is, with its furry flowers and purple stamen and hairy stems. There is something rather Harry Potter-ish about it, and it looks far too exotic to be a UK native, even though it is. I found this one growing from a crevice in a wall above the stream in Milborne St Andrew, and it does seem to have a liking for chalky soils such as those in parts of Dorset. It is a member of the Borage family, and is much loved by pollinators. 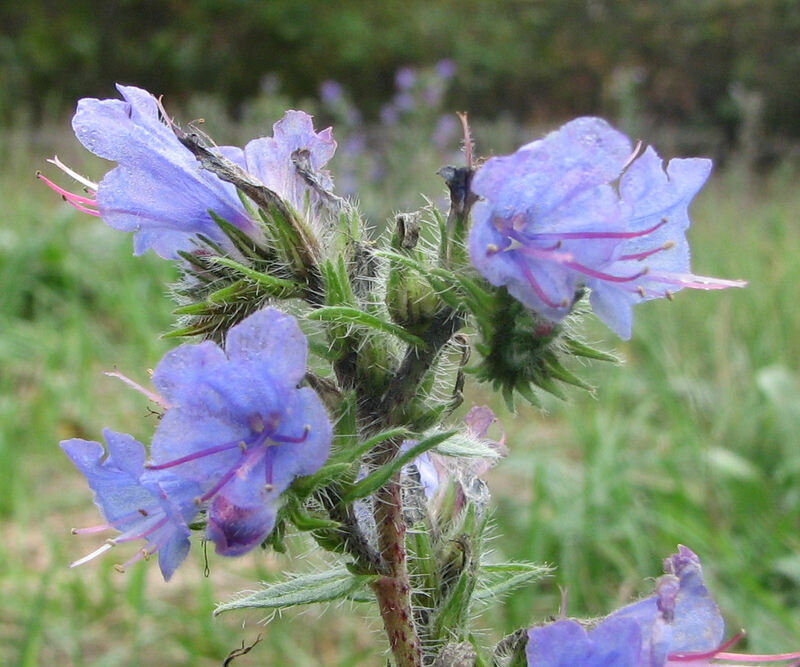 The name ‘bugloss’ comes from the Greek for ‘ox-tongued’ and refers to the rough texture of the plant. The ‘viper’ bit comes from the way the stamen resemble a snake’s tongue, from the look of the seed head, and from the belief that the plant could cure snakebite (probably another manifestation of the ‘Doctrine of Signatures’, whereby it was believed that God had designed the appearance of a plant to indicate what it could be used for). 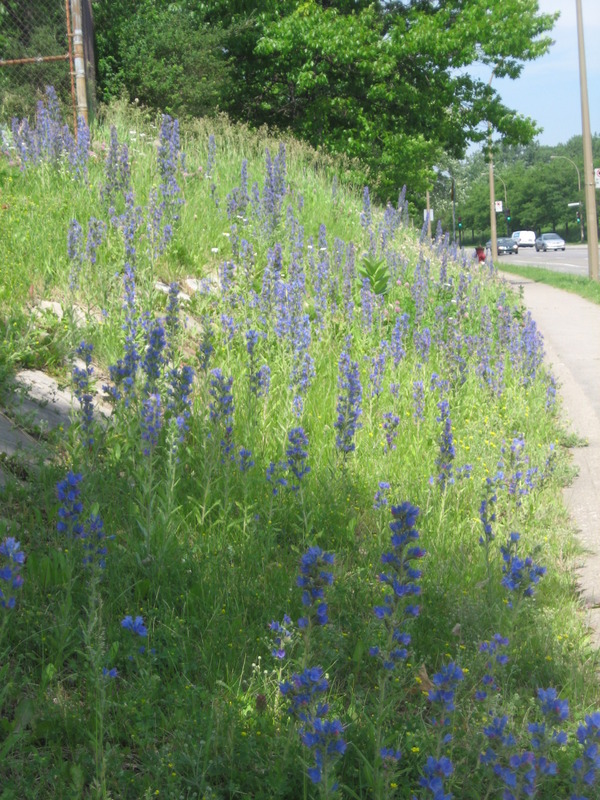 Viper’s Bugloss is native to Europe and temperate Asia, and has been introduced to North America, where it is sometimes known as ‘blueweed’ and has become invasive in some parts of the continent. The plant contains alkaloids, which are poisonous, although there are no known cases of humans suffering from eating it. 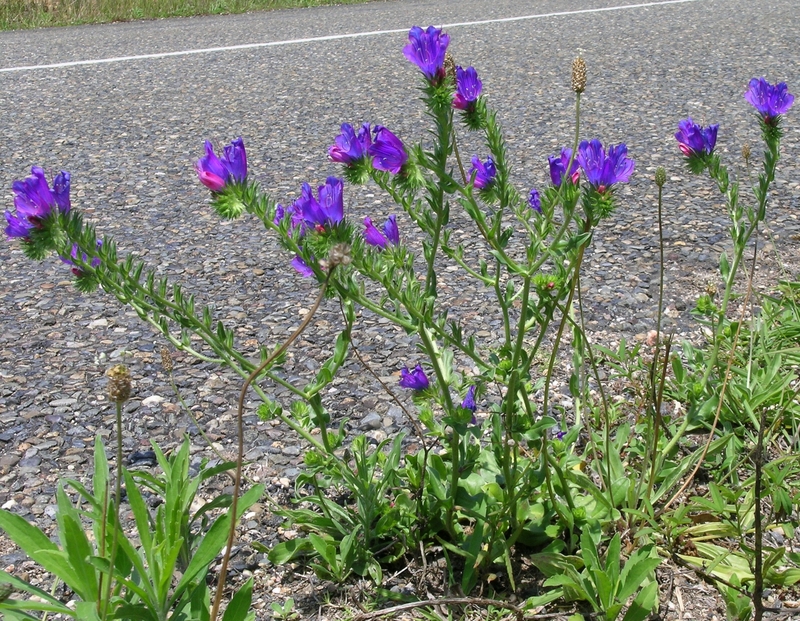 Because of its long taproot it can be difficult to remove from pasture, and in 2006 a paper suggested that bulls in Spain died as a result of munching on viper’s bugloss and common ragwort. However, while ragwort gets a very bad press, viper’s bugloss is generally tolerated. 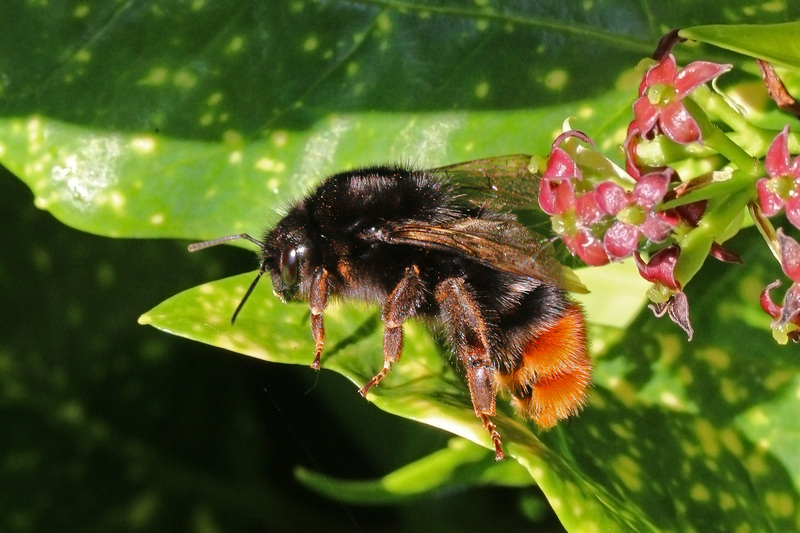 I sometimes wonder how and why we get these bees in our bonnets about particular plants whilst ignoring others that, it could be argued, are equally ‘dangerous’. Could the popular press have something to do with it, I ask myself (sarcastically)? In Australia, a closely related plant (purple viper’s bugloss or Echium plantagineum) is known as ‘Patterson’s Curse’, because it is said to have escaped from the garden of a Mrs. Patterson. After a bushfire in Canberra destroyed all the other pasture, 40 horses are said to have eaten the bugloss and suffered liver failure, resulting in them having to be destroyed. Incidentally, you can see here how the buds start off pink and turn blue when the plant is ready to be pollinated, like so many members of the borage family. In addition to treating snake bite, the plant is said to be useful for ameliorating fevers, headaches and inflammation, with the best parts of the plant being the leaves that grow close to the ground, directly from the root. which sounds like a good thing. As with all plants, and particularly ones that are known to be poisonous, I would suggest a good degree of circumspection however. Remember those horses in Canberra. I am off to Austria next week, and I note that in the Tyrol, people were warned against consuming viper’s bugloss because it was said to stimulate sexual desire. Presumably all that fresh mountain air and yodelling was aphrodisiac enough, not to mention the lederhosen. 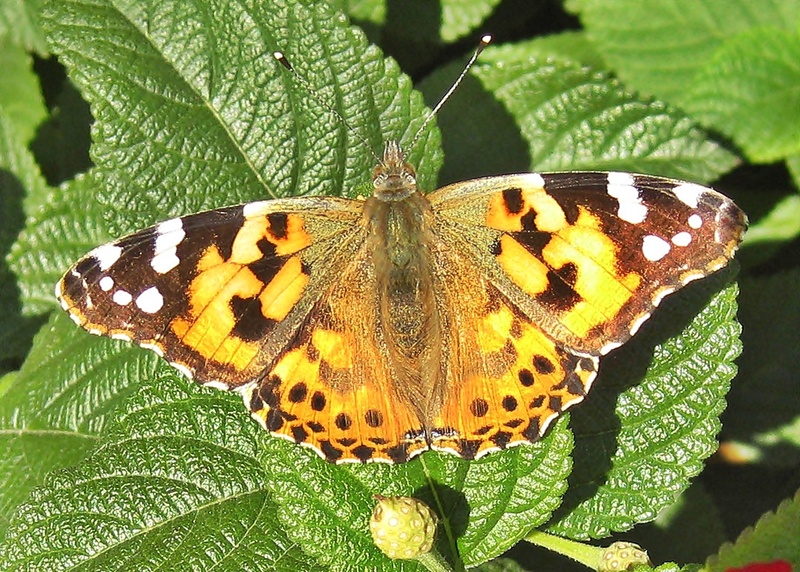 It is also a favourite foodplant of the migratory Painted Lady butterfly (Vanessa cardui). These insects come out of their chrysalises in the Atlas Mountains of North Africa before heading north and east to find foodplants for their caterpillars. Fortunately the caterpillars have wide-ranging tastes, from thistles to mallows, but they also love viper’s bugloss. In years when there are not many foodplants close to home, or if a large number of adults have hatched and survived, there may be extraordinary irruptions of the adults in the UK as they arrive en masse: I remember seeing over thirty in one small patch of community garden one morning a few years ago. All the more reason for growing lots of plants for butterflies and bees! 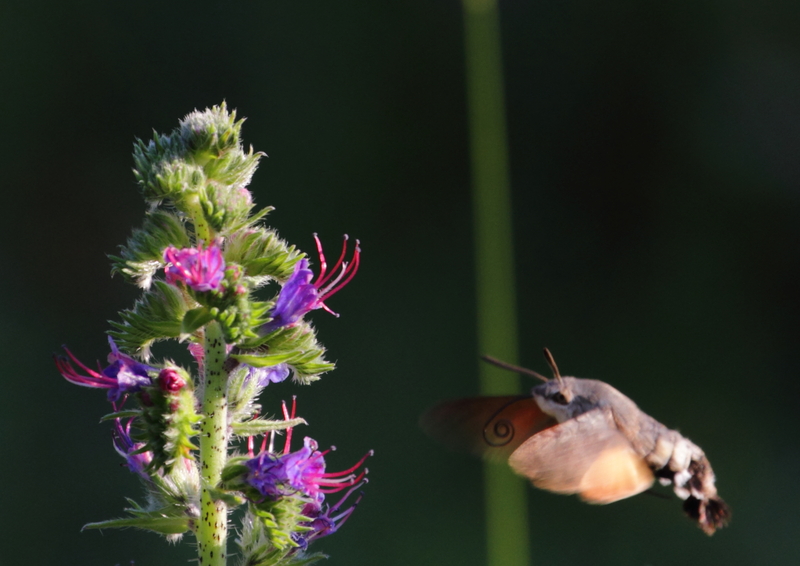 The butterflies also have a love for viper’s bugloss as a nectar plant, so it helps both caterpillars and adults. 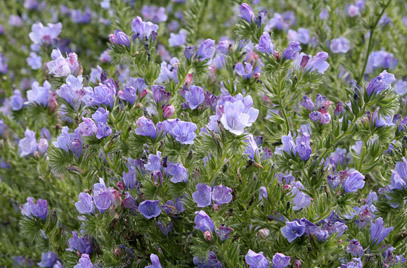 And as if that wasn’t reason enough to welcome viper’s bugloss to your garden if you get a chance, looky here…. Perhaps the most exciting insect find of all, however, is not particularly spectacular to look at, but is a sign of how our flora and fauna are likely to change with the climate. 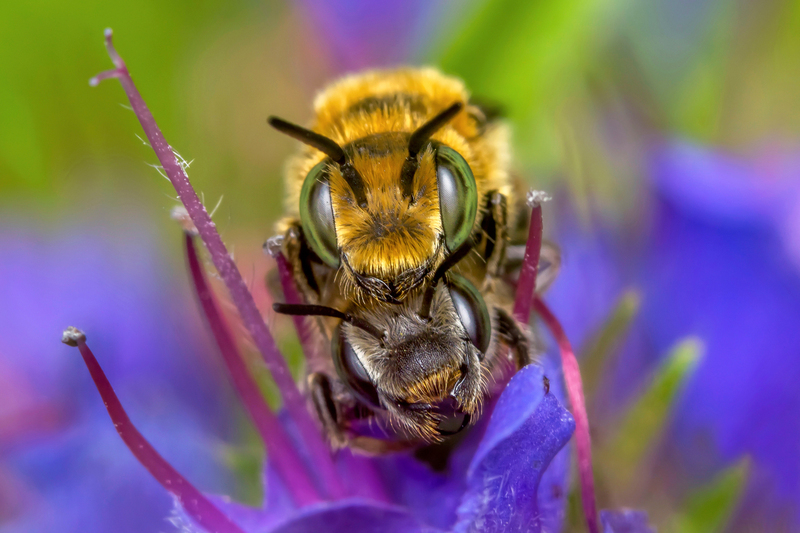 The viper’s bugloss mason bee (Hoplitis adunca) is a brand new species in the UK and is currently found at only one site, the Greenwich Peninsula Ecology Park in London. It strongly prefers species in the Echium genus to any other plants and, while it makes its tiny nest in every thing from empty snail shells to old beetle tunnels, at the park it was found nesting in an artificial ‘bee hotel’. Which just goes to show that if you provide lots of habitat in your garden, you never know what will turn up. It also points up the importance of ‘brownfield’ style sites for insects – many prefer these areas, even though they look uninviting to us, because they mimic the Mediterranean conditions of dry, poor soil and exposed, hot places to warm up that these insects are used to. I am reminded of the amazing book ‘Wildlife of a Garden – A Thirty Year Study’ by Jennifer Owen, who was a hoverfly specialist and who discovered several species that were completely new to science in her Leicestershire back garden. This was before the current (much welcomed) advent of ‘wildlife gardening’ – she had, by her own description, a very ‘ordinary’ garden with a lawn and flower beds and somewhere to dry clothes, and yet, because she paid attention and recorded the visitors that she had, she was able to list 2673 species of plants and animals. I wonder what the counts for our gardens would be? So many creatures, especially the tiny ones, escape our notice altogether, and that’s without all the ones who whistle through when we aren’t looking. We are surrounded by wonders, and I for one only notice a tiny proportion of them. This entry was posted in Uncategorized on June 27, 2018 by Bug Woman. I love this flower Vivienne, I still remember where and when I saw my first one – with delight- and now I know a place I can see them every year. Well, you notice more wildlife than most folk do, Bugwoman, but I hope you spot a few elegant pairs of lederhosen too, shortly. I love viper’s bugloss – I always feel summer has arrived the first time I see those bright splashes of blue among the sand dunes here..It’s a plant which thrives on the edges of rabbit burrows, so it’s not surprising that one area of the dunes has a particularly spectacular display of viper’s bugloss – dogs aren’t allowed there, and a large population of rabbits has moved in.